This painting began my series Global City Babel. A stylized Hebrew acronym for the Tanack is carved into the surface and on top of an appropriated image of Bruegel’s Tower of Babel. One day God's global city will be united through the living Word.The musical score from the American folk hymn How Firm a Foundation and text from various languages form the base layer. The handmade frame itself is part of the painting. It includes the sovereign eye of God over-seeing the events of mankind. 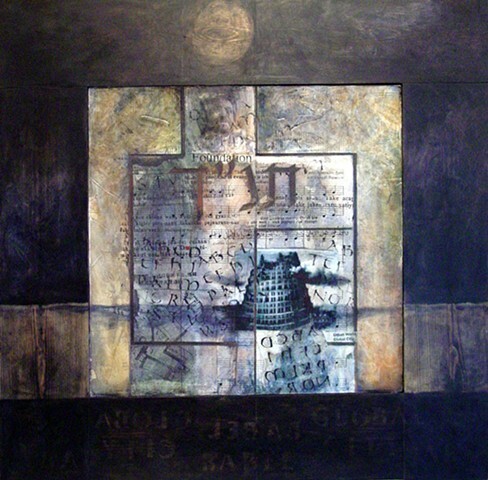 This painting was included in an exhibit at the Museum of Biblical Art in New York City and included in the exhibit catalogue, The Next Generation: Contemporary Expressions of Faith. It is now part of the permanent Donna Spaan Collection at Calvin College, Grand Rapids, MI. It is available as a limited edition giclee reproduction.